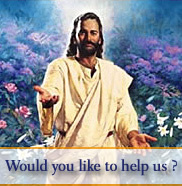 We would like to welcome you to Jesus4UsAll, and we would like to thank the Lord Jesus Christ that he brought you to us and that you found us. We do not believe in coincidences, everything has a purpose and a reason. So that fact that you're here means that God is already working in your life, more even than you can imagine or believe. No matter what your reason for coming here is, and no matter what your feeling and going through at the moment in your life, be reassured that God Loves you and knows you better than you even know yourself, and he wants to help you to come to know that He has good plans for you, not only for the now but for eternity. So, welcome again and again, and take this opportunity yourself to just come to an even greater realisation that God does love you and is with you now, waiting to help you. All he needs is you to trust him and to search for him and he will guide you through whatever your circumstances or challanges are right now. He wants to give you a deeper knowledge of His love and He wants you to understand that He really has your best interests at heart. Our books will help you to experience the love and power of God in your life through prayer, testimonies and reading and meditating on His Word. We pray that they will enable you to let Jesus enter your heart and that he will touch you with His healing power. We hope that our books will also be a source of blessing, salvation and freedom for you and your family. If you would like us to pray for you please leave us you prayer request. We hope you enjoy visiting this site. Why not take a look and see which book could help you the most at this time, or just browse this site and see if there is something that will guide you into a deeper understanding of the Christian faith. You may also like to join our community. Although this is still under construction now, you can always register with us and when it becomes available then we will notify you to participate there. Thank you for coming here and once again, your very welcome, please come again and again as this site will continue to develop and so there will be more coming to browse through and find that may be of interest to you.